Sediment in centrifuged animal urine samples generally indicates some sort of renal malfunction. UriStain™ urine sediment staining and microscopic examination provide a convenient method for identifying cellular and non-cellular sedimentary components and contributing to a timely, accurate diagnosis. Healthy kidneys generally produce clear, cloudless urine with little or no insoluble matter. Urine with a murky appearance, caused by suspended solid material, could indicate kidney malfunction potentially leading to complete renal failure. Kidney failure may already be suspected based on other observed symptoms or reports of incidents such as injury or poisoning. Abnormally opaque or coloured urine samples can provide veterinary laboratories with a diagnostic opportunity without the need for invasive tissue sampling biopsy. Centrifugation of a urine sample in a veterinary centrifuge will cause any solid matter to concentrate at the bottom of the sample tube. Microscopic examination of the re-suspended precipitate may assist in identifying the type and source of any solid material. Unambiguous visualisation and differentiation of the sedimentary components are essential to the rapid and accurate diagnosis of the cause of any renal problem. 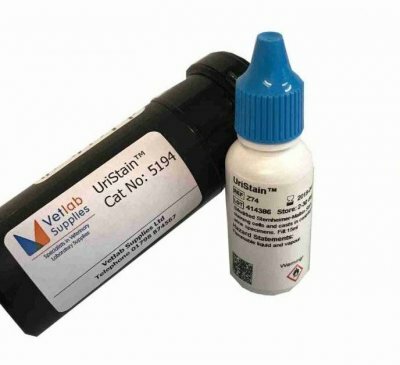 Hardy Diagnostics UriStain from Vetlab Supplies is formulated to enable veterinary laboratories to categorise the most likely solid materials responsible for clouding in animal urine samples. Colour responsive UriStain™ assists the veterinary microscopist in distinguishing between living cellular material, and non-viable cells, cellular fragments and other non-soluble material. Parallel examination of an unstained microscopic preparation helps identify sedimentary components based on their unstained as well as on their stained morphology. Red blood cells, in suspensions of urinary sediment, will stain faintly pink, while the nuclei of white cells and other epithelial cells appear a deep purple colour. Yeast cells, recognisable by their morphology, also appear purple as do dead bacteria. Fungal mycelia and spores show a lighter purple. The parasitic protozoan, Trichomonas, stains light blue but might also appear colourless. Fat droplets, with their characteristic ‘honeycomb’ appearance, remain unstained. Together with their morphology, hyaline casts – a mucoprotein potentially indicative of glomerulonephritis, and other granular material, can also be characterised by their response to UriStain visualisation. Composed of certified source dyes, the UriStain balance of Ammonium Oxalate, Safranin and Crystal Violet provides veterinary laboratories with a stable, convenient and practical staining protocol based on a reformulation of the Sternheimer-Malbin urine sediment procedure. Ready to use, the UriStain™ reagent is supplied in convenient 15ml dropper bottles and requires no filtration prior to adding to the centrifuged urinary sediment. Veterinary microscopes equipped with low power magnification (100X) and high power magnifications (400X) enable the stained components to be precisely identified and quickly cell-counted if required. This product is directly comparable to Sedi-Stain, if not better! For further information visit our website or Tel: 01798 874567 and we will be delighted to help.